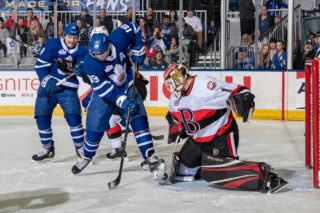 Jeremy Bracco scored with under three minutes remaining to lift the Marlies over the Belleville Senators on Sunday, completing the weekend sweep in the final game of the regular season. It was a tough, hard-fought game throughout with both teams throwing their weight around from the opening faceoff. Belleville opened the scoring past the midway point of the first after Daniel Ciampini intercepted a pass and scored on the resulting breakaway. Andrew Nielsen had the Marlies’ response less than three minutes later, firing a shot through traffic from the point that beat Senators goalie Filip Gustavsson. Brady Ferguson had the assist on Nielsen’s sixth of the season. Just a minute and five seconds later, Pierre Engvall put the Marlies ahead with a great shot top shelf, scoring his fourth of the year since joining the team. Jeremy Bracco and Timothy Liljegren had the assists. Andrew Sturtz scored his first goal just past the two minute mark of the second to tie things up again, but Adam Brooks was able to convert on a power play one-timer late in the second to reinstate the lead. Engvall and Mason Marchment had the helpers on Brooks’ eighth. Belleville tied things up again early in the third as Nick Paul scored in the first minute. With under three minutes remaining, Bracco scored off a bank shot from behind the goal line for what would ultimately be the winning goal of the game. His sixth of the season was assisted by Brooks and Justin Holl. Ian Scott made the start for the Marlies, the first of his professional career. The 18-year-old fourth-round Maple Leafs draft pick (2017) made 30 saves to secure his first victory as a Marlie. With the victory, the Marlies finish the regular season with a 54-18-2-2 record, the seventh best single-season performance in American Hockey League history. 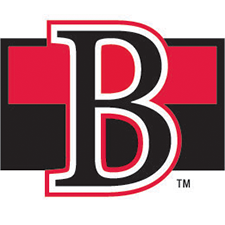 They beat Belleville in nine of the twelve games between the two sides. 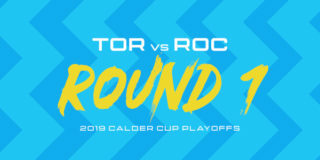 All eyes will now turn to the playoffs where the Marlies will take on the Utica Comets in the first round, starting on Saturday at Ricoh Coliseum. Andrew Nielsen opened the scoring for the Toronto Marlies at 16:14 of the first period. Nielsen has seven points (1 goal, 6 assists) in his last six games. Pierre Engvall scored on the power play at 17:19 of the first period and later added the secondary assist on Brooks’ second period power play goal. Engvall has eight points (4 goals, 4 assists) in his nine games with the Marlies this season. Adam Brooks scored on the power play at 17:44 of the second period and later added the primary assist on Bracco’s third period goal. In his rookie season, Brooks has 19 points (8 goals, 11 assists) in 57 games. The Marlies are 7-0-0-0 when Brooks scores a goal. Jeremy Bracco scored the game-winning goal at 17:07 of the third period and earlier recorded the primary assist on Engvall’s first period goal. Bracco has 14 points (2 goals, 12 assists) in his last 11 games. Brady Ferguson had the lone assist on Nielsen’s first period power play goal. Ferguson has four assists in five games with the Marlies. Timothy Liljegren registered the secondary assist on Engvall’s first period goal. In his rookie season, Liljegren has 17 points (1 goal, 16 assists) in 44 games with the Marlies. Mason Marchment had the primary assist on Brooks’ power play goal. Marchment has 26 points (11 goals, 15 assists) in 44 games this season. Justin Holl recorded the secondary assist on Bracco’s third period goal. The Marlies are 16-1-0-0 when Holl has an assist. Holl finished the season with a career high 28 points (7 goals, 21 assists). Ian Scott stopped 30 of 33 shots in his first American Hockey League game. Toronto went 2-for-2 on the penalty kill and 2-for-9 on the power play. Belleville had a 33-29 edge in shots in all situations. Scott Pooley led the Marlies with six shots on goal. 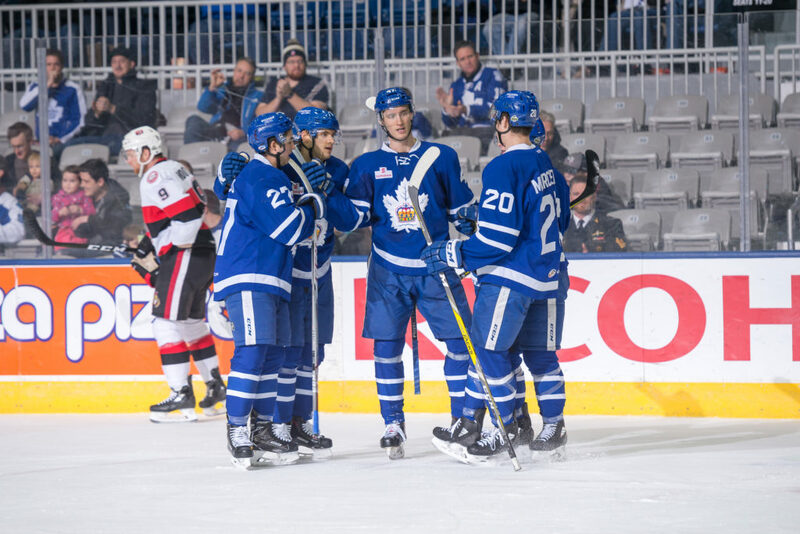 The Marlies finish the season 39-12-2-1 against North Division opponents and 9-3-0-0 against the Belleville Senators. 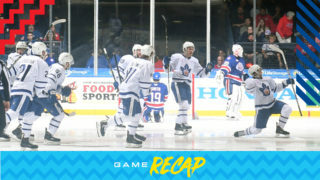 The Marlies outscored the Senators 41-24 in the series. 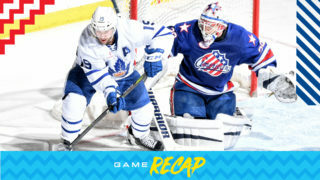 The Toronto Marlies clinched a playoff spot on March 10th and captured the Macgregor Kilpatrick Trophy on April 6th as regular season champions. The Marlies set the American Hockey League record for number of road wins in one season (30) and most points on the road (63). The Marlies matched the franchise record of 54 wins in one season and have the seventh best single-season record in AHL history (.737). I thought he was terrific. Obviously, it’s a difficult circumstance for a goalie to come in in a game like this when we have a lot of our regulars not playing and we’re not nearly as organized. We looked like a team that hasn’t practiced together out there a lot of the time and that’s tough on the goaltender. I thought he was excellent. He looked confident to me, he made some nice saves, he battled right to the very end. So, that was a really nice debut for him and I’m sure it will help his confidence going forward which is what we hope will come out of this. This is a tough game for any of our regulars, this is a tough game to get into mentally. You look around the room, there’s not a lot of familiar faces and those are young guys that have really relied on the leadership and presence of some of our older guys and they’re not here and suddenly they are taking on bigger roles. So, it’s a little bit outside their comfort zone but it’s big and it’s important for their development. I was trying to push them to really step up in a game like this and take advantage of that opportunity. Obviously, we didn’t have a lot happening on our power play today, we were a little unorganized today. But that group was able to get us two goals on the power play. Bracco is able to get the game-winning goal. So, that’s what you’re looking to see in these types of games, for them to step up when they have to, and I was happy with them here today. 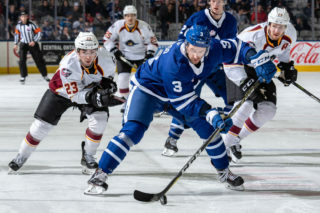 The Toronto Marlies will look to enter the 2018 Calder Cup Playoffs on a high note as they face Belleville for a twelfth and final time on Sunday to wrap up the regular season. Coming into Sunday’s game, the Marlies (53-18-2-2) have won two straight this weekend, defeating Laval on the road Friday night and taking a 6-4 win over the Rocket yesterday. Belleville (29-41-2-3) have been surging of late, winning five of their last ten games including a 3-1 win over Utica last night. The two sides know each other well, having played eleven times already on the year. 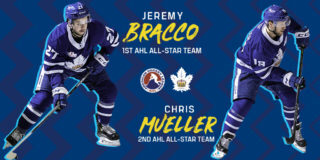 The Marlies have won eight of those meetings, led offensively by Chris Mueller who has collected nine points (2G, 7A) in games against Belleville this season. Miro Aaltonen and Justin Holl have both collected seven points against the Senators while Ben Sexton and Max Reinhart lead Belleville with five points each in the regular season series. After picking up a pair of assists yesterday, Carl Grundstrom has collected three points since joining the Marlies last week and will look to continue building on that success moving forward. Trevor Moore had a goal and an assist yesterday, and he enters play with a five-game point streak, collecting seven points (2G, 5A) over that span. Sunday’s game is our annual Fan Appreciation Night and tickets are still available. Fans coming to the game can enter our Insider Seat Upgrade contest for the chance to be moved up to platinum seats. Can’t make it to the game? Watch all the action on Leafs Nation Network or AHL Live.